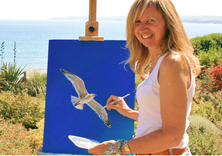 My art courses are designed to allow you to shine. Experience stimulating, intellectual conversation and be taken on an amazing adventure of laughter and fun. Utilise your artistic skills and find the artist in you. Remove the blinkers created by modern day living and discover new perspectives and perceptions. Through relaxation and knowledge achieve greater awareness of the powers of the right side of the brain and balance your preconceived views. Translate your newly acquired skills into beautiful and rewarding artworks. "A real eye-opener, a different way of looking at everything, seeing so much more, very exciting and informative. Thenk you so much. I really enjoyed the lesson."